Moral dilemmas are situations in which the decision-maker must consider two or more moral values or duties but can only honor one of them; thus, the individual will violate at least one important moral concern, regardless of the decision. This chapter draws a distinction between real and false dilemmas. The former are situations in which the tension is between moral values or duties that are, more or less, on equal footing. In a real dilemma, the choice is between a wrong and another, roughly equal wrong. The latter are situations in which the decision-maker has a moral duty to act in one way but is tempted or pressured to act in another way. In a false dilemma, the choice is actually between a right and a wrong. Anne is the project manager for a large industrial project (run by a Nordic company) in a developing country. On a crucial day during the project, the entire plant’s electricity suddenly went out. Large quantities of cement were beginning to congeal in their mixers, and it was crucial to quickly reactivate them. More than one thousand employees were unable to do their work. Anne contacted the local authorities to solve the problem. A bureaucrat turned up at the plant and explained that he could turn the electricity back on very quickly—on the condition that he be allowed to bring ten of the company’s PCs back to the town hall, which had a desperate shortage of PCs that was preventing the bureaucrat and his colleagues from providing adequate service to the local community. Thus, he suggested a trade-off: PCs for electricity. In this manner, Anne and her company had the option to make a significant contribution to the local community. Time was of the essence, and Anne had little time to dwell on the alternatives. There was no time to contact her supervisors in the firm’s home country for advice or instructions. She had to figure the situation out by herself. If the cement were to congeal, that would mean a considerable delay in the project, and several operations would have to be redone, at a high cost. That cost would be much higher than that of losing ten PCs, which could be easily replaced. Anne also had sympathy for the local bureaucrats and (the population they serve), who she believed would probably make very good use of the PCs. On the other hand, the demand was blackmail, and if she gave in this time, then it may happen again at other crucial stages of the project. Anne faced a difficult choice. What should she do? Anne wanted to honor not just the moral value of finishing the project on time and within budget but also that of not giving in to blackmail and corruption. One of these values had to give way. There was no way in which Anne could act in a completely moral manner. Moral dilemmas such as Anne’s are pervasive in working life. They occur in the public and private sectors and in organizations of all sizes. Any decision-maker can encounter them, whether at the executive level or below. In hectic working environments, people can become blind to their moral dilemmas, thus failing to see the moral dimensions of their choices. Understanding the nature of moral dilemmas is an important prerequisite to identifying them and finding ways in which to deal with them responsibly. Kidder (2005) suggested that, although there are myriad potential moral dilemmas, they tend to fall into four patterns: truth versus loyalty, individual versus community, short term versus long term, and justice versus virtue. Categorizing moral dilemmas in this manner can be a useful way to start addressing them. Morality can be understood as a set of personal and shared beliefs about what is right and wrong in interpersonal interactions (Goodpaster, 1992, p. 111). Over time, individuals and groups form moral convictions and beliefs about how they ought to behave toward others. The universe of beings that people have moral obligations toward can include other animals. The concepts of morality and ethics are understood to be synonymous in many contexts. Indeed, at the outset, the concepts had the same meaning. The term morality has Latin roots, whereas the term ethics stems from classical Greek, but both words originally referred to respectable behavior in a given society. Gradually, however, these concepts have become labels for different phenomena. As noted above, morality can be defined as a set of beliefs and convictions about right and wrong; this concept applies to interpersonal interactions, as well as to people’s obligations toward animals. 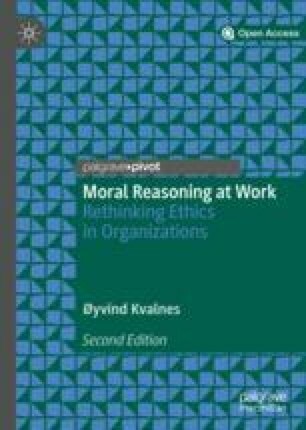 Ethics, on the other hand, is the academic discipline of thinking systematically about right and wrong (Kvalnes & Øverenget, 2012). People learn morality and ethics in different ways. Moral beliefs and convictions are typically adopted through social interaction, whereas ethics is an academic discipline that must be learned by reading books, attending seminars, and such. There are ethics courses and exams, but there are no equivalent activities for morality; there are only moral tests, both in everyday life and in more extraordinary situations. A person’s actions on these tests determine whether that person is living in accordance with his or her moral convictions. This distinction is similar to the one that Kahneman (2013) draws between fast and slow decision-making processes. Kahneman divided these processes into System 1 thinking, which is quick and impulsive, and System 2 thinking, which is slow and analytical. When a person faces a morally challenging situation, he or she can draw upon the resources of both systems. There may not be time for a full-scale analysis of the options at hand, however, and the person may have to rely on a gut feeling or moral impulse. Kahneman documented how people are prone to making mistakes when they rely solely on quick thinking and what their hearts tell them in the moment (Kahneman, 2013). People can reap great benefits from activating the slower System 2 processes when weighing alternatives. However, those who rely too heavily on analysis can become passive and immobile in situations that call for rapid responses. In some cases, by the time that an action has been thoroughly considered, it is too late to take the correct course. People have both System 1 and System 2 resources in place to think about and respond to moral dilemmas. On the one hand are moral intuitions and gut feelings about what should be done; these are based on moral beliefs and convictions. On the other hand are opportunities to engage in ethical analysis so as to identify alternative courses of action and test whether those options are justified. A dilemma, in the most general sense, is a situation that requires a choice between two options that are (or seem to be) equally undesirable or unsatisfactory. There are nonmoral dilemmas, in which the choice is between options that are undesirable or unsatisfactory for reasons other than morality. For instance, if a person seeks to buy both a book and a shirt but can only afford to purchase one of them, choosing one over the other will inevitably lead to disappointment, in that it will fulfill only one of the two desires. There need not be any moral dimension to this decision for it to be a dilemma. A moral dilemma is a situation in which the decision-maker has to give priority to one moral value over another (Brinkmann, 2005; Maclagan, 2003; Toffler, 1986). Such dilemmas “arise when, faced with a difficult situation (e.g. fair treatment for some versus job security for others), two or more such values conflict in the perception of a decision-maker, or when one is assessing another’s moral choice” (Maclagan, 2003, p. 22). A person who faces a dilemma must decide which moral duty to prioritize; “whichever action is taken … will offend an important moral value” (Maclagan, 2003, p. 23). In a moral dilemma, it is impossible to live up to all of one’s moral convictions and beliefs regarding how one should behave in that situation. In the opening example, Anne was morally committed to both keep the industrial project on track and reject the blackmail attempt. In that situation, one of these moral commitments had to give way at the expense of the other. She did not have a clear System 1 intuition, and even after initial System 2 reflection, the dilemma and tension remained. Her supervisors in the company’s home country were unavailable, so she had to respond to the bureaucrat’s offer on her own. A moral dilemma can occur because of a prior personal mistake. This is called a self-inflicted dilemma. A classic example is the Bible story about King Herod. On Herod’s birthday, his stepdaughter Salome danced so well that he promised to give her whatever she wanted. Salome consulted her mother about what she should wish for, and she decided to ask for the head of John the Baptist on a platter. The king now had a choice between honoring the promise to his stepdaughter and honoring the life of John the Baptist. The king had inadvertently designed a moral trap for himself—a dilemma in which, whatever he decided, he would be acting immorally. One contemporary and everyday instance of a self-inflicted moral dilemma involves double booking. Say that an individual makes separate and incompatible promises to two people she will be somewhere at 2:00. She cannot keep both promises and thus must choose which one to break. She may have good moral reasons to keep both promises, but she must choose between them. In a narrow sense, a moral dilemma is a situation in which the moral values at stake are of equal importance. In this example, the two appointments have equally strong pull and significance. The individual’s moral reasons for keeping the two promises are thus equally strong. Neither choice is less wrong than the other. This situation is one in which moral wrongdoing is inescapable (Gowans, 1994). In a wider sense, there can be moral dilemmas in which a person has strong moral reasons to act in one way, as well as notable—but not equally strong—moral reasons to act in another way. When considering the nature of two promises, it may be reasonable to conclude that it is better to fulfill one rather than the other. Deciding to keep the former promise and break the latter means a loss of some moral value, but it is not really a hard moral choice, as no one will have reason to challenge or cast doubt upon the rightness of the decision. The choice, in other words, is between a lesser wrong and a greater wrong. If an individual double-books, but one meeting has a higher priority than the other, the person whose meeting is canceled will be disappointed and irritated but will likely understand the decision based on the priority of keeping the other promise. In the Herod case, there is an imbalance in the moral weight of the two options. Herod, in his exuberance, made a questionable promise to Salome, and in turn, she took advantage of the situation and made a horrific request. Herod had stronger moral reasons to spare the life of John the Baptist than he had to keep his word to his stepdaughter. He would give up some moral value either way, but one option was morally superior. This situation can still be called a moral dilemma—although not in the pure sense of representing a decision between moral values that are on equal footing. False moral dilemmas are instances in which it is clear what ought to be done but in which there is temptation or pressure to act in another way. In business ethics, the distinction between true and false dilemmas has also been described as the distinction between dilemmas and temptations (Brinkmann, 2005, p. 183; Kidder, 1995, p. 7). Later in the book, I discuss professional ethics and how the handling of conflicts of interest are at the core of professionals’ moral responsibilities toward clients, customers, patients, students, and other users of professional services. For instance, lawyers and accountants can be tempted to prioritize self-interest over their clients’ interests. The knowledge gap between the professionals and the clients is such that the risk that clients will detect such choices is minimal. The professionals may claim that they are facing moral dilemmas when, for example, opportunities arise to overcharge clients. In the vocabulary of this book, the most appropriate term for such a situation is false dilemma. This situation may resemble a real dilemma in that the decision-maker must decide between two options that are both undesirable in some way, as cheating the client feels wrong, but so does turning down a chance to earn extra money. However, the former feeling has a moral component that is lacking in the latter. Thus, conflict-of-interest situations are generally false moral dilemmas with only superficial similarities to real dilemmas. In connection with the dichotomy between real and false dilemmas, the continuum between them needs to be acknowledged, as Maclagan (2003) suggested. On one side of the spectrum, there are situations in which there is perfect balance between the opposing moral values. For example, being compassionate toward another person and being honest with that person can have equal moral weight. On the other side of the spectrum are situations in which one option is clearly morally right and the other is clearly morally wrong, as when a professional must choose between self-interest and clients’ interests. In some other cases that involve self-interest, however, the distinctions are not so clear-cut; for instance, pursuing self-interest on an organizational level can have some moral value. Concrete cases belong somewhere on the spectrum between purely real and purely false dilemmas. Anne had to decide whether to get the plant’s electricity back by giving in to the blackmail from the local bureaucrat, or to stand firm and allow for a costly delay. How exactly should this situation be classified: as a real or false dilemma? This depends on the details of the case. The analysis that Anne had to make in preparation for her decision did not require her to precisely place the dilemma on this scale, but it did require her to acknowledge the nature of the situation in general. In Anne’s case, she decided on a two-step response. First, she handed over the PCs so that the bureaucrat would turn the electricity back on, thus getting the project on track again. Second, she invited the senior bureaucrats from the nearby town to a meeting in which she explained that the company wanted to contribute to the local community—but not in such a haphazard way. Instead, she proposed a systematic plan in which the company would help the town to modernize its electronic equipment. With this initiative, Anne came to be on better terms with the local administrators, thus avoiding further blackmail situations. Ben is the manager of a small private banking unit within a large financial services group. Results have slumped recently, mainly due to a bitter conflict between one employee and some of his colleagues. They complain that he is rude and difficult to cooperate with. Ben has attempted to mitigate, to no avail. National legislation prohibits the option of firing the quarrelsome employee, at least in the short run. Key members of Ben’s unit have become very upset by the situation and have started to look for work elsewhere. A recent turn of events is that the employee himself has applied for a job in a different part of the financial services group. Ben has agreed to serve as a reference person. He receives a phone call from the manager of the unit currently contemplating to hire the employee. She is particularly interested in the employee’s social skills. “Does he function well with his colleagues?” she asks. If Ben gives an honest answer, he is likely to be stuck with the employee for a long time. If he is vague about the employee’s social skills, he may get rid of a problem. He then runs the risk that his honesty will come up for questioning later. It also feels wrong to lie to another person in order to get rid of a problem at work. Lying in this case would be an attempt to transport one’s own problem over to someone else, instead of taking responsibility and deal with it in one’s own organization. How should Ben respond to the question about the employee’s social abilities? In this example, Ben had to choose between being honest about an employee’s antisocial behavior and telling the truth, which would prevent the employee’s ability to move to another organization. Like Anne, Ben acknowledged that, regardless of what he decided to do, it would be wrong. At first glance, this appears to be an obvious example of a false dilemma. Ben’s choice was between the moral value of being truthful to others and the selfish desire to get rid of a human resources problem. It was tempting for him to withhold information and thereby help the difficult employee move to a new job, but doing so would have violated Ben’s moral duty to be honest in business dealings. Ben could have reasoned that the employee deserved another chance in a new work environment. By this logic, if the employee were allowed to start anew in his career, he might be better able to fulfill his personal and professional potential. That is all very well, but that consideration is relatively weak and clearly is meant to camouflage a violation of the moral requirement to be straightforward and honest when acting as a reference person. The extent to which Ben’s situation is a real or a false dilemma depends on the details of the case. I have used this case as a starting point when teaching ethics to both business managers and business-school students, as well as in research on moral psychology, the purpose of which was to map the extent that this situation creates moral dissonance, thus causing managers to engage in moral neutralization (Kvalnes, 2014). I return to this topic in Chap. 13. People’s responses to Ben’s dilemma reveal their moral convictions. When I ask for justifications regarding the choice of whether to be truthful, the participants in my ethics courses have come up with a wide variety of reasons, thus expressing their individual loyalties and preferences. People’s first responses are often based on their gut feelings, which cause one option to instantly feel right or wrong. These are from System 1, in which intuitions are dominant; my task as the facilitator is to introduce the participants to the slower System 2 type of reflection and analysis (Kahneman, 2013). Ethical reasoning involves slowing down to become aware of the moral issues at stake and progressing from a state of mismatching feelings to one in which the participants are able to recognize the ethical and moral foundations for their own choices. Moral dilemmas are omnipresent in organizations. Situations on all parts of the scale, from acutely real dilemmas to false pseudo-dilemmas, constitute challenges that decision-makers should prepare for. The following four chapters describe analytical resources from moral philosophy and ethics. These principles and concepts can serve as tools for determining what one ought to do and for justifying one’s choices regarding moral dilemmas.